It wouldn’t be the slightest bit of a stretch to call Finding Nemo a modern classic. When it was released in 2003, Finding Nemo became a worldwide cultural phenomenon. For a time, it was the highest-grossing animated film in the world, and I think it’s safe to say it was probably the most popular animated film ever released up until Frozen hit theaters over a decade later. Pixar had made a name for themselves with the Toy Story films, Monsters, Inc. and A Bug’s Life beforehand, but Finding Nemo was the film that put them at the top of the mountain of animated films, where they have more or less remained ever since. 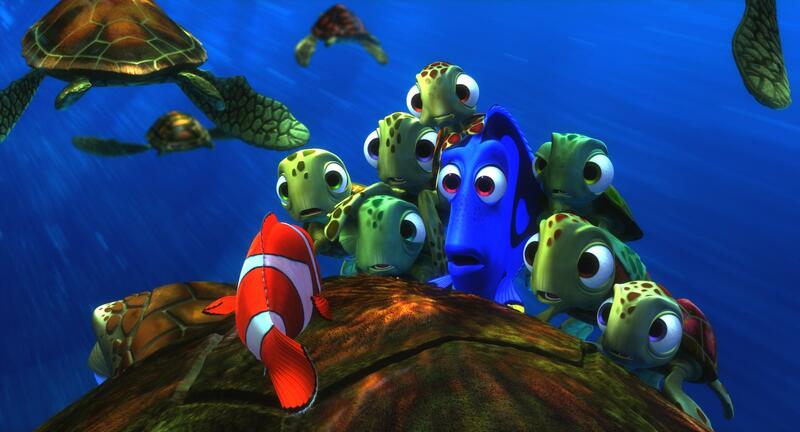 The success of Finding Nemo certainly isn’t undeserved, as it remains an absolutely charming and heartfelt feature. 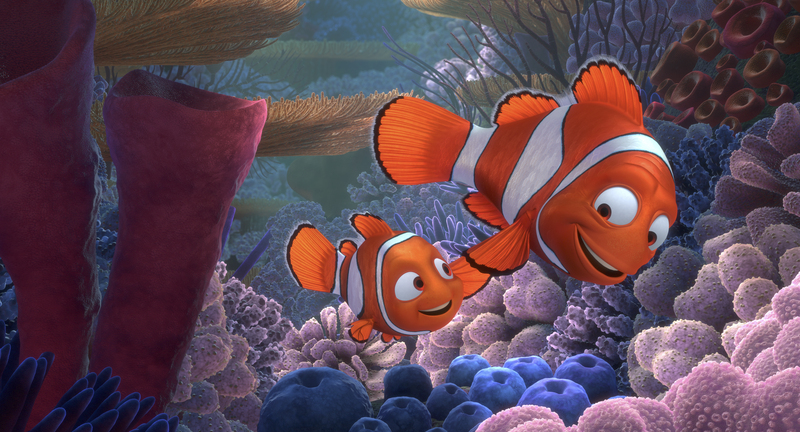 Finding Nemo tells the story of Marlin the clownfish (Albert Brooks), and his son Nemo (Alexader Gould). The film opens in tragedy. Marlin and his wife Coral are expecting parents, with hundreds of eggs ready to hatch, when a barracuda emerges and knocks Marlin unconscious. When he awakes, Marlin discovers his wife is gone, along with all but one of their eggs. He names the remaining child Nemo, and promises to never let anything happen to him. It’s quite a shocking opener, to be honest, but an effective one, as it immediately sets the tone for the film in motion, as well as making Marlin an appropriately sympathetic hero. Disney films often feature overprotective parents, but rarely show audiences their perspective of things. What director Andrew Stanton did here was give Marlin an entirely justifiable means for both the character’s motivations and his flaws. You can’t help but feel for Marlin, even during the times when he’s in the wrong. The main plot kicks in a few years later, as Nemo is preparing for his first day of school. An argument with Marlin upsets Nemo, who tries to spite his father by doing something reckless, which ends with the young clownfish getting nabbed by a scuba diver and taken away. Marlin panics and gives chase, but quickly loses sight of his son onboard the speeding boat. Marlin then makes it his mission to find his son and fulfill his promise, even if it takes him across the entire ocean. Marlin ends up being accompanied on his adventure by Dory (Ellen DeGeneres), a regal blue tang who suffers from a severe case of short-term memory loss, and one of Pixar’s greatest creations. Meanwhile, Nemo ends up in the fish tank of a dentist’s office in Australia, where he teams up with a gang of aquatic misfits – lead by a moorish idol named Gill (Willen Dafoe) – to hatch an escape plan. The story is filled to the brim with heart and humor, with some of Pixar’s best writing up to that point. Just about every character, from the main heroes to those with smaller roles whom Marlin comes across on his journey (including a surfer dude sea turtle named Crush, voiced by director Andrew Stanton himself), leaves a lasting impression. Another highlight of the film is the animation itself. Water-based stories and animation have a history of going together like peanut butter and jelly, and Finding Nemo remains sound proof that it’s a combination made in heaven. The imagery still looks stunning, and each character shows the effort and dedication that went into giving all of these aquatic animals personalities. It’s a beautiful film to look at from the first frame to the last. 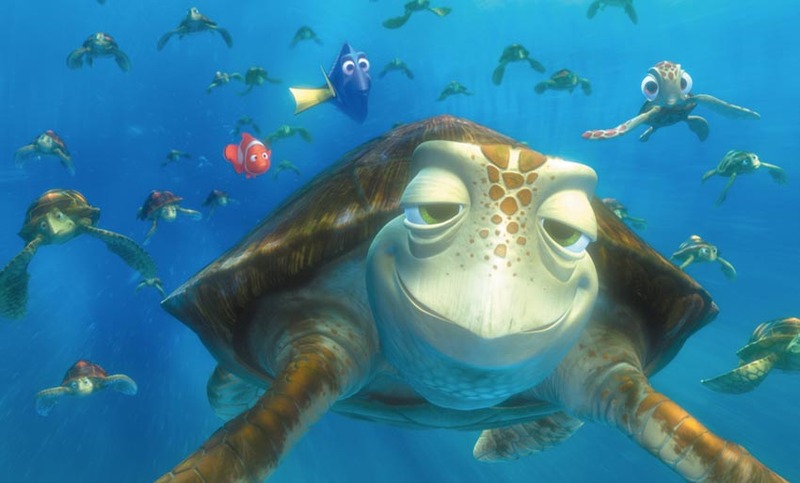 On the musical side of things, Finding Nemo also boasts one of Pixar’s best soundtracks, with musical themes that beautifully capture the serenity and ambiance of the ocean, along with more – *ahem* – bubbly tracks to go with them. To put it simply, Finding Nemo is simply a great movie for audiences of any age. It’s cute, fun and relatable to children, while also being equally so for the adult crowd. Much like Monsters, Inc., the only real downside may be that Pixar has since bettered it. Pixar followed up Nemo with the strikingly sophisticated The Incredibles a little over a year later, and director Andrew Stanton would eventually create Wall-E, which would use a similar sophistication to magnify the feelings Nemo started. But if simply falling a little short of some of its creators’ other works is its only real drawback, then Finding Nemo has certainly done well for itself. It holds up – *ahem* – swimmingly. If you’re looking for a great film to bring a smile to your face, and perhaps a tear or two to your eyes, you can never go wrong with Finding Nemo, no matter your age, and no matter how many times you’ve seen it. Great review of Finding Nemo! I’m going to be honest here and say that I’m not the biggest fan of Finding Nemo. I account this to the fact that I didn’t watch it when I was younger. The first time I saw this (besides watching it in Spanish for school, which probably also didn’t help me) was way later after I had already seen the likes of The Incredibles, Up, and Toy Story 3. I still recognize all your points though, particularly about heart and humor, and think this is still a pretty good movie. I also see the value of this being one of the first Pixar movies to explore those important emotions, and my wife told me that she would always cry during the opening. Another aspect that turned me off from this movie was how disjointed it felt. It seemed like more a vignette movie, like Studio Ghibli movies tend to be, as opposed to a more cohesive storyline. That style isn’t bad, and other Pixar movies definitely are like that too. Finding Nemo did it a little too much for my taste. 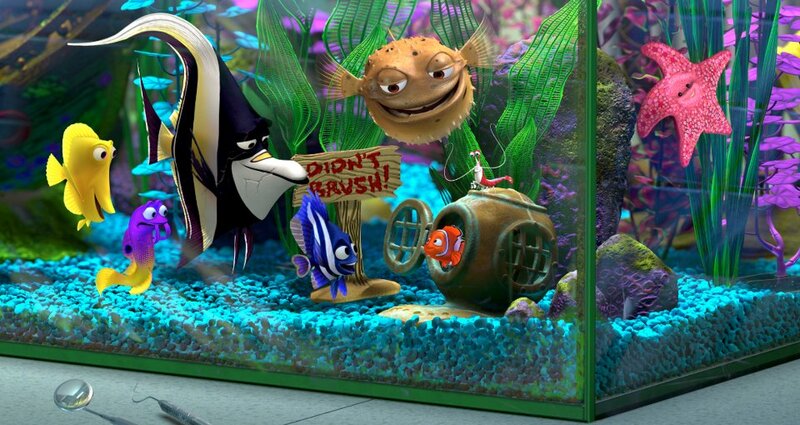 Also, I didn’t like how Nemo was able to just get out of the aquarium and meet up with Marlin and Dory. I hate to come off as a Scrooge and hijack your comments, so definitely don’t let me! 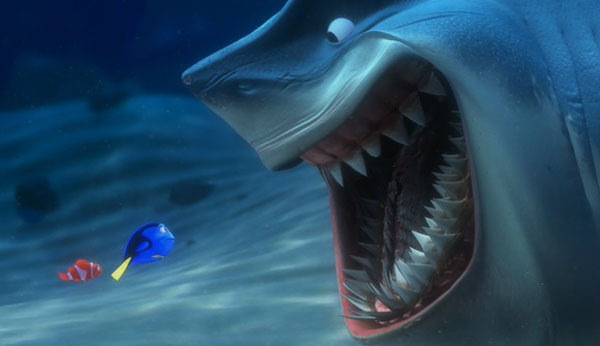 I just don’t like Finding Nemo, though I respect it as a movie that propelled Pixar higher into popularity. I mean, we were seeing Nemo and Dory plushes well after the original movie and before Finding Dory was even announced! Anyway, great job again! I’m enjoying the extended month of Pixar! Whoa there buddy, ye best be watchin’ what ye be sayin’ ’bout Studio Ghibli in these parts! In all seriousness, that’s probably the most critical I’ve ever seen anyone be towards Finding Nemo, but I suppose it isn’t as great as some of Pixar’s later films. So if you saw them first, I guess I can understand why Nemo might seem relatively underwhelming. Well, I actually like Studio Ghibli films. They’re different in that they have more of a vignette style, but I love them. It’s Finding Nemo’s version of that style that I just don’t like as much. And yeah, I haven’t found anyone that actually shares my opinion of Finding Nemo, though most people I talk to just love how cute the fish are and how sad the opening is. I rewatched this movie the other day, and I still find it underwhelming based on the fact that later movies exist. For some reason, I still want to see Finding Dory though. Arguably my favourite Pixar film – as you would know given my PSN ID – and couldn’t agree more with your review! Actually scratch that, I would’ve given it a higher rating myself but to each his own 😛 Nostalgia aside, the sheer emotionally resonating quality of Finding Nemo is absolutely true to Pixar’s repertoire and arguably kickstarted its trend of powerful resonance. It was afunny, thrilling, heartbreaking, and insightful experience with all of its endearing qualities weaved together into a resonating package. It’s definitely a great one. And yes, your PSN and Nintendo Network ID kind of gave it away. 😛 You should have a crack at reviewing a movie or two sometime. I’d love to read your take on Nemo. Yeah I’ve been thinking about that myself! Though I feel that I have trouble articulating my thoughts when reviewing anything, so I wonder how I’d fare with film reviews. What do you find more difficult to review, video games or movies? I’ll probably give it a shot after my Tropical Freeze review. Also I was thinking of listing my favourite exclusive games on their respective consoles. Looking forward to your Tropical Freeze review. I expect great things! And that’s definitely a great idea. I’d love to see your list of favorite exclusives. I’ve been thinking of doing something similar myself. I remember when I was a kid I didn’t like this movie too much because many areas terrified me. Now it’s probably my favourite Pixar film. Previous Previous post: Pixar Month Continues!